Posted on Fri, Feb 24, 2012 : 10:30 a.m. The only way to watch the third-ranked Michigan hockey team in their final regular-season series is to head down US-23 and visit scenic Bowling Green, Ohio. Sitting at second place in the CCHA standings, the Wolverines have a chance at finishing first in the regular-season standings, but need a sweep of last place Bowling Green State (7:05 p.m., 1050 WTKA or MGoBlue.com) to have a shot. Here are three things to watch for in the series. Bowling Green has many shortcomings, none more so than its offense. The Falcons average 1.65 goals, and against Michigan, no one on the team has a good track record. Not a single player on Bowling Green’s roster has more than one career point against Michigan and just seven have one. Bowling Green hasn’t scored a power-play goal in nine consecutive games and has scored more than two goals in a game just twice in its past 15 games. That, combined with the fact that Michigan has allowed more than two goals in just four contests over its last 17 games — going 13-2-2 in that span — doesn’t add up to offensive production for Bowling Green. Sophomore defenseman Kevin Clare was held out of the series finale Saturday with Northern Michigan after suffering an upper body injury the night before. For the first time since Jon Merrill’s return to the team, that meant freshmen defensemen Brennan Serville and Mike Chiasson were in the lineup for the same game. Serville and Chiasson played well on Saturday, but don’t expect to see them both in the lineup again. Clare is healthy. 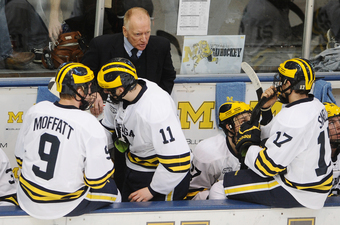 Berenson said holding him out of the game Saturday was more a precautionary measure. He participated in practice all week, and Berenson likes what he’s getting out of the sophomore. Clare has just eight points in 32 games played with year, compared to nine in 29 for Chiasson and seven in 28 on the year for Serville. But it’s not his offense that Berenson hopes to garner from Clare. “He’s primarily a defensive defenseman, and he’s been doing a good job of that,” Berenson said. Plus, having the left-handed Clare paired with one of the freshman right-handers means Merrill and Lee Moffie, who as a defenseman actually leads the team in points with 29, stay together on a line. The Wolverines should be shuffling after this weekend. Though Bowling Green is in the basement of the CCHA standings, it is a capable team. Besides last weekend’s series against Ferris State, the Falcons have been competitive against the best of the league. Still, this is a series Michigan should sweep.